Embark on a fearsome journey onto Dragon Island, an arid land of molten rock, free spin bonuses and cash rewards guarded by fire-breathing scaled dragons. Enjoy the tropical background that this game offers and spin your way through 5 reels in an online slot game where you must match paylines of dragons and Wilds to extinguish the flame and earn some cash. You can also see our homepage for more info. NetEnt delivers high quality video slots for little over 20 years now and is one of the forerunners of this market. Several of their games have been awarded and the development team always shows a lot of innovations and creativity. NetEnt provides flexible digital casino solutions, always adapting to the newest changes of technology. They can pride themselves of the large number of the world's most prominent casino operators they serve and their very qualitative video slots. Escape a little from reality and enter this wonderful world full with fantasy and mystical creatures. Dragon Island looks beautiful and will immerse you into it’s majestic world. Behind the see-through reels you can see a mountainous landscape next to the ocean. The reels are framed by two pillars to each side and vines that grow around them. On top of pillars are dragon head sculptures that look dangerous and gorgeous at the same time. The playing controls are below the reels and are very easy to overview. On the five reels and three rows you will see the usual playing card symbols A, Q, K, J and 10 written in stone. The high paying symbols are the dragons, there is a pretty white cloud dragon, a majestic blue water dragon, a dangerous-looking green dragon, a brown dragon and a orange fiery dragon. You can choose to activate the Win Both Ways feature which will make it possible to form winning combinations from left to right and right to left. This feature will double your wager amount but it will also activate the golden wild. If you land the golden wild anywhere on the reels and it helps to form a winning combinations your win will be subject to up to an 8x multiplier. Look out for the volcano, it is the scatter of this game and will activate the main feature. If you land three, four or five of it anywhere on the reels you will be awarded with 10, 20 or 50 free spins respectively. During the free spins feature you will be granted and expanding wild covering an entire random reel before each spin. This will increase your chances of big wins and help form many winning combinations. If you land more scatters during this feature you may retrigger this feature. There are 15 paylines but with the win both ways feature you can increase the chances of landing them. To enter this fantasy world you have to place a minimum bet of 10p or, if you consider yourself somewhat of a high roller, up to 150 pounds. Dragon Island is gorgeous and plays very well, too. The art-style adds a lot to the game feel and will immerse you quickly into its scenery. The features are engaging and increase the replay value of this video slot. 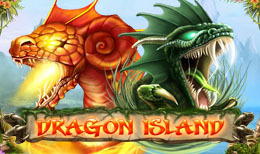 Dragon Island will provide you an entertaining gameplay experience filled with mystical creatures. If you enjoyed Dragon Island you might also like Drive Multiplier.